Apple has dominated the smartphone market for over a decade, so when the iPhone 7 Plus was announced in 2016 to Apple’s global following, fans awaited the new release with bated breath. The iPhone 7 Plus is a great smartphone for anyone who wants the Apple brand but maybe doesn't want to fork out for the most recent iPhone release. Thanks to the newer iPhones now available, the iPhone 7 is more affordable than ever, and Metrofone has some fantastic deals to save you money and give you fantastic perks. With the iPhone, it can often be a difficult choice deciding between the smaller handset and the Plus model, so which one is right for you? 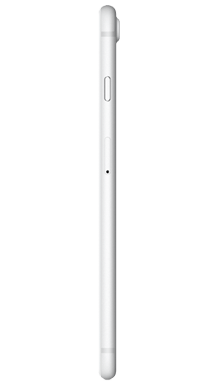 The iPhone 7 Plus essentially looks exactly the same as the 6S Plus, with the classically curved corners and rounded edges that we are used to seeing on an Apple handset. While some may have expected a more dramatic upgrade in the design department, we can’t help but think that this was a clever move on Apple’s part; not messing with a winning look. There were, however, a few subtle changes that make the iPhone 7 Plus stand apart from the 6S Plus; a larger camera lens on the rear of the handset and a home button that is a fingerprint sensitive touchpad as opposed to a clickable button. Another difference was the additional colour option of jet black; a glossy and sophisticated finish which stands out against the usual matte options. 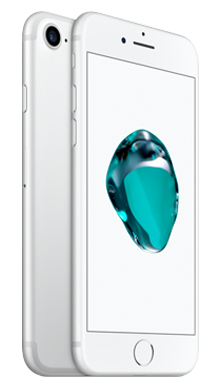 The iPhone 7 Plus also comes with long-awaited water resistance, a feature that Apple had previously been criticised for excluding from the design of the iPhone. When you combine this with the ion-strengthened glass and oleophobic coating on the handset, you have a durable smartphone that will withstand the wear and tear of daily life. With that being said we all know how costly it can be to replace an iPhone screen, so we’d definitely recommend investing in a decent case and a robust screen protector. The major difference between the 6S Plus and 7 Plus is the removal of the headphone jack. This was a controversial and risky move when Apple first announced the iPhone 7 models, or so it seemed. Nowadays more and more smartphone manufacturers are eliminating the headphone jack on their handsets, so it would seem that Apple was in fact, ahead of the crowd. Even though neither the iPhone 7 or 7 Plus feature full HD specs in their display, the 5.5-inch Retina display is still great, and delivers an exceptional viewing experience that you've come to expect from an iPhone handset. 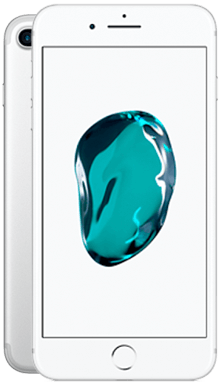 With the iPhone 7 Plus you get sharp details, vivid colour and well-balanced contrast to give you a screen quality that is noticeably better than previous iPhones, with a screen that is 25% brighter than the older handsets. While the iPhone 7 Plus doesn’t have any support for hi-res music, this isn’t unexpected, particularly when you consider that it isn’t a feature on even newer Apple handsets. Despite this, the sound quality is still brilliant, unsurprising when you consider that Apple has long been praised for their audio experience on the iPhone. The removal of the headphone jack doesn’t just affect the design of the iPhone 7 Plus, but how you listen to your music. Ideally, you need to get your hands on a pair of wireless Bluetooth headphones or Apple’s very own Airpods, but if not then you can use the headphones that are included in the iPhone 7 Plus box, or use your regular headphones by utilising the adapter that comes with the handset. While this adapter and headphones are useful and may save you a penny on a new pair of headphones, they connect through the charging port, meaning that if you’re charging your handset then you cannot listen to music. With this in mind, we’d strongly recommend going for the wireless option; it's not only more convenient but nowadays you’ll find a decent pair of Bluetooth headphones at an affordable price. As is usually the case, the Plus model of the iPhone 7 features a slightly better camera setup than its smaller sibling. There are two sensors on the rear of the iPhone 7 Plus’ a 12MP wide angle sensor along with a 12MP telephoto lens. Both work together in tandem for fantastic shots that are significantly better than older iPhones. In addition to this, there’s also 2 X optical zoom to allow users to focus in closer on important features and also keep details sharp and clear. If smartphone photography is your thing then you’ll appreciate the improved performance in low light, as well as the new Portrait Mode that allows you to take incredibly dramatic portraits which focus on your subject and blur the background. Round the front is a 7MP camera that delivers great photos to satisfy any selfie addicts out there. The iPhone 7 Plus comes with either 32GB, 128GB or 256GB of internal storage, giving you plenty of room for all of your favourite apps, photos and most important files. There’s also 3GB of RAM on board. 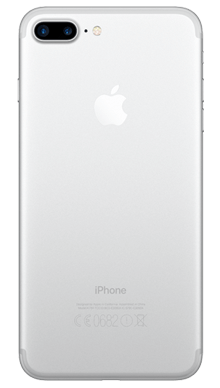 Like the smaller handset, the iPhone 7 Plus runs on the fast and reliable Apple A10 chip, which delivers a fantastic smartphone experience, despite the fact that it has since been surpassed by the A11 chip. One thing that is missing from the iPhone 7 Plus is the compatibility with wireless charging. In all honesty, we wouldn’t let that deter you from purchasing this handset. The battery life is significantly better than older handsets and the smaller iPhone 7, so if you find yourself regularly running out of power due to being constantly attached to your smartphone, we’d definitely recommend going for the larger handset. 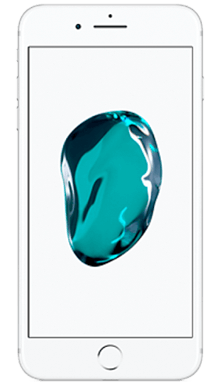 The iPhone 7 Plus is a really fantastic smartphone and becomes an even more attractive prospect for anyone on the hunt for a new smartphone when you take into account the fact that it is becoming increasingly more affordable thanks to the release of the iPhone 8 handsets and, of course, the iPhone X. While the design of the handset sticks to the classic iPhone look, that only means that the iPhone 7 Plus is a really good looking phone with a decidedly premium feel. The screen is 25% brighter than older iPhones, and when you add to that a great sound quality, watching films, TV and/or listening to music on your iPhone 7 Plus is a thoroughly impressive experience. The addition of a second lens on the camera setup makes for greatly improved photographs, particularly in low light. Portrait Mode is a fantastic addition which allows users to experiment with their smartphone photography. Apple is known for developing fantastic processing chips to run their smartphones, and the iPhone 7 Plus is no different. The A10 chip delivers a smooth and responsive smartphone experience, and with a significantly improved battery and plenty of internal storage, the performance on the iPhone 7 Plus is extremely impressive. Here at Metrofone, we’re always on the hunt for the very best iPhone 7 Plus deals so that our customers can take advantage of massive savings. When you get the iPhone 7 Plus on EE, you can rest assured that you’re on board with one of the UK’s leading mobile communication networks, giving you fantastic service and great connections wherever you are. We’ll always give you a great cashback offer where we can, and you can get fantastic free delivery so that you could have your brand new iPhone the very next day. If you think that the iPhone 7 Plus is the handset for you, or if you’d like to find out more about a specific deal with Metrofone, then why not call one of our great customer service team today, on 0333 900 1144.